The little rain we’ve had this year, thanks to La Nina, has still managed to trigger some important winter activities in nature. One of the joys of being a naturalist is venturing out with intrepid hikers — rain or shine — to catch the action. 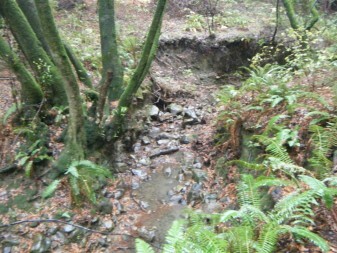 On a recent rainy day at Redwood Regional Park, our three-mile hike followed the eastern side of the park, from Canyon Trail to East Ridge, then dropped down Prince Trail to the Stream Trail for the return trip. Some of the things I love about this hike is touring three different habitats as you follow the route. It’s a physically demanding hike with a steep ascent at the start of the trail, so you get a little workout while you’re out there. I also appreciate the quiet seasonal beauty of the park with highlights that change throughout the year. Some of the seasonal wonders you’ll find in the park this time of year include fungus, migrating rainbow trout, and overwintering ladybugs. Since the East Bay Regional Park District doesn’t allow collecting of any natural resources, a fun alternative for fungi fans is “mushroom watching.” Most of us enjoy wildflowers without picking them, likewise there is an amazing diversity of fungus to learn about and appreciate. The shapes range from round balls to your standard mushroom on a stem with every shape in-between, along with multiple colors and patterns. For a sampling of different types to look for, check out this website from further north at Redwood National Park. It showcases the many types of fungi found in their park. One of the amazing things about fungi is the extensive, web-like underground system, called mycelium, that gives rise to the fruiting body, or mushroom. The mushroom’s main job is to elevate the spores above ground level to allow them to be distributed so new organisms can start. Scientific American reported that honey mushrooms, a species of fungus in Oregon, qualifies as both the largest and possibly oldest living thing. See more about the honey mushrooms of Eastern Oregon in this article from Scientific American. Another treat as you descend Prince Trail at the intersection with the Stream Trail is a large group of overwintering ladybugs. We discovered hundreds clustering on fence posts, tree trunks, and on sunny days, you may find them flying about the clearings. You can see them in action in this QUEST video, Ladybug Pajama Party. Following the Stream Trail back along the canyon bottom, we kept a lookout for migrating rainbow trout. When the creek rises it signals the adult rainbow trout to make the journey from San Leandro Reservoir to their natal creeks. 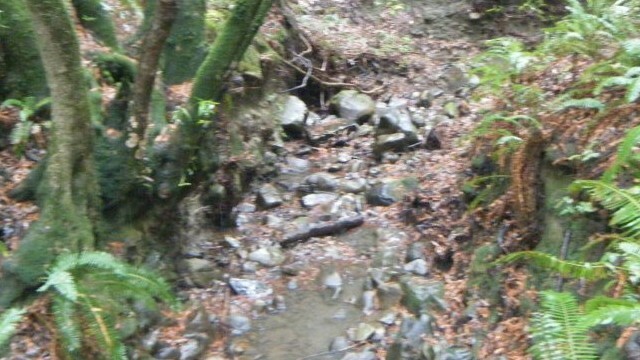 Redwood Creek is a tributary of San Leandro Creek, the place the first rainbow trout was collected and named by Dr. Gibbons from the California Academy of Natural Sciences in 1855. Shortly after that, Lake Chabot dam was built effectively landlocking the anadramous fish but also preserving the genetic integrity. So go out and try a rainy hike. You might discover some of the wonders that abound on a wet winter day! To learn more about mushrooms check the Mycological Society of San Francisco’s website. 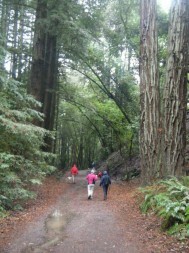 I love Redwood Park, but haven’t been there for 6 months. This article entices enough to get me back there soon. Thanks!